Girl Spends 9 Years In Garage, Abused By Foster Parents In Cult. A 15-year-old girl was rescued from a garage where she was kept captive for nine years. She has not been named in the press, but according to Time Magazine, the girl was taken into custody of the Argentine foster system after her parents were found to be financially unable to care for her and her six siblings. They were all separated, and her family lost track of her at 2005 for reasons unclear. However, one of her older sisters had not given up on finding her again. She tracked her down and then reported the suspected abuse to police. When officers removed the girl from the garage she weighed less than 45 pounds. Reportedly, her foster parents only fed her bread and water during her entire nine years in captivity. The girl said she had only been outside of the garage twice, and was kept in the garage with a monkey and dog. The girl claimed that whatever her foster parents would feed the animals – seemingly left overs of their own meals – she would be physically abused if she tried to eat any. The foster parents have since been arrested and charged with abuse and slavery. The girl is recuperating in intensive care in a Buenos Aries hospital. 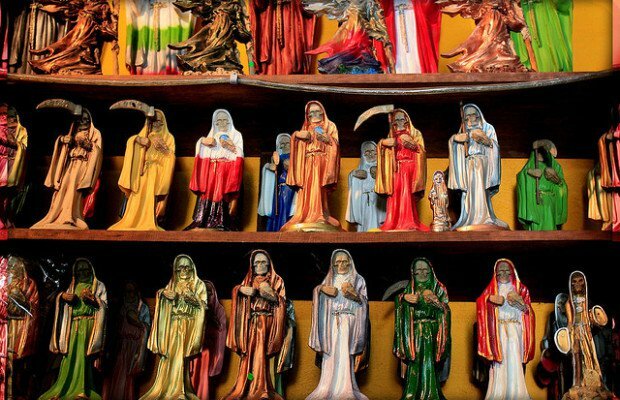 Oddly, her foster parents were devotees of Santa Muerte, or “Saint Death” – a skeletal figure often dressed and posed like icons of the Virgin Mary. While many of her devotees are criminals involved with drugs, prostitution, and murder, the cult has gained popularity among many dissatisfied with the Catholic Church for failing to deliver them from poverty. Rare, Never Before Seen Historic Photos – Some Will Creep You Out!